Ajay Shah Ambassador of School Choice Campaign: Fund Students, Not Schools! 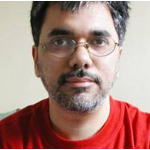 Ajay Shah is a Ph.D. in Economics from the University of Southern California, Los Angeles and a B.Tech. in Aeronautical Engineering from I.I.T., Bombay. He has been a Consultant to the Department of Economic Affairs, Ministry of Finance, New Delhi from year 2001 to 2005. He was also Associate Professor, IGIDR, Bombay and President, CMIE, Bombay from year 1993 to 1996. He has also been Consultant to the Rand Corporation, Santa Monica. Planners, Outstanding paper award for Moonis and Shah at Vth Capital Markets Conference, UTI ICM, Outstanding paper award for Sarma, Thomas and Shah at IIIrd Capital Markets, Conference at UTI ICM, All-University Pre-doctoral Merit Fellowship at USC and National Talent Search Scholarship, 1981.